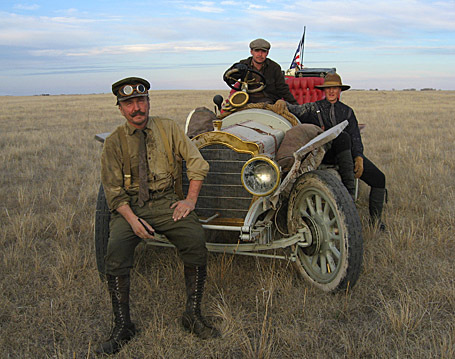 Michael Hamm wrote to tell us about his film project, The Greatest Auto Race on Earth, which recounts the 1908 NY to Paris auto race, much of which traveled the Lincoln Highway in the U.S. The 2-hour show is now available on DVD. Hamm, founder of Frame 30, which produces various film projects, served as writer, director, and producer; it took eight years of planning and two years of filming. The project won the EP Ingersoll Award from the Society of Automotive Historians, the Special Jury Award from the Houston International Film Festival, 2 Platinum Pixies from the American Pixel Academy, and 3 AMPIAs. Amazingly, they BUILT a Thomas Flyer, German Protos, and Zust as full scale running picture cars for the film. This entry was posted on March 25, 2010 at 12:16 pm and is filed under film/video, highways, history, Lincoln Highway, Road trip, transportation, travel. You can follow any responses to this entry through the RSS 2.0 feed. You can leave a response, or trackback from your own site.